G83 Peck Drilling Cycle G-code is modal so that it is activated every X and/or Y axis move, and it will rapid to that position and then cause this canned cycle (Drilling) to be executed again, until it’s canceled (G80). As G83 is a Peck drilling cycle so the depth for each peck in G83 drilling cycle will be the amount defined with Q.
until Z depth is reached. 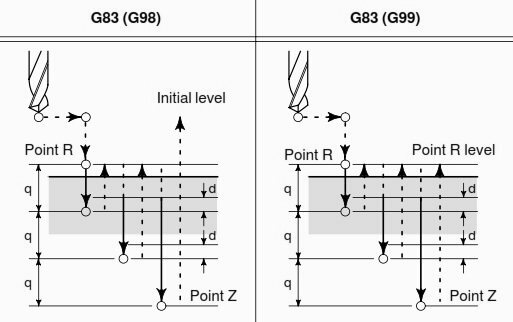 Use G98 and G99 for the Z position clearance location for positioning between holes. 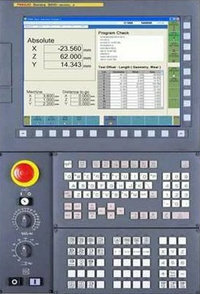 Haas CNC machining centers allows to repeat rigid tapping operation with accuracy. So the standard G84 tapping cycle can be used for repeat tapping the same hole or multiple holes….